The first bridge at this site was a wooden swing bridge built to carry Llanthony Road over the new docks when they were constructed in 1794. This was replaced in the 1860's with an iron swing bridge. 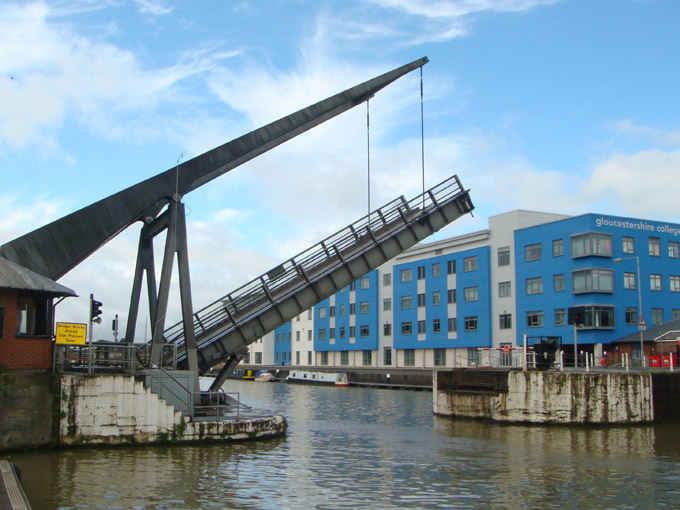 in 'The Gloucester and Sharpness Canal' Hugh Conway-Jones reports that this iron bridge carried a rail line linking the Midland Railway which had a line on the east side of the docks with the Great Western Railway which ran into the west side of the docks. Like all the bridges on the Gloucester and Sharpness Canal Llanthony Bridge is operated by a bridgekeeper, who works between 9 a.m. and 6 p.m.,thus restricting movement on the canal to those hours for any vessel that cannot pass under the brides when lowered. Even a narrow boat needs the bridges to be opened.